We can repair your chimney's mortar for a beautiful new look and better waterproofing. GF Sprague specializes in chimney repairs of all kinds, including chimney repointing and reflashing. If you notice that your chimney's mortar is cracked or deteriorating, we can help prevent further damage. We can also install leak-proof chimney flashing to ensure that the space where your chimney meets your roof is completely watertight. To find out more about our chimney repair and replacement services, don't hesitate to contact the home improvement experts at GF Sprague! We offer free cost estimates in Newton, Needham, Wellesley, and nearby. Cracked or crumbling mortar joints are not only ugly, they can also allow water to seep inside your chimney – which can lead to serious and expensive damage. If you have loose bricks or stones or cracks in your mortar, our trained technicians will inspect your chimney and recommend the best solution to ensure it is functioning safely and looks beautiful. Chimney repointing is the process of repairing masonry joints by removing damaged mortar and replacing it with new mortar. Repointing serves to improve both appearance and water resistance, and will completely restore the original condition of your chimney. The chimney repair experts at GF Sprague will expertly match your existing mortar so that you won't even notice where the mortar was replaced. 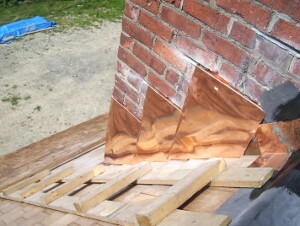 Chimney flashing will prevent chimney leaks and keep the area watertight. Your chimney's flashing is the sheet metal that that keeps the intersection between the base of the chimney and the roof watertight. If something goes wrong with the flashing, water leaks can get through and cause serious damage to your chimney, your roof, and even the interior of your home. That's why chimney reflashing is essential if your flashing is damaged or worn down. GF Sprague can replace your chimney flashing and provide you with a chimney flashing installation that will stay leak-proof for years to come. Our chimney flashing will give your leaky chimney an essential upgrade so that your home can get the water protection it needs. To find out more about our chimney repair and replacement services, contact the experts at GF Sprague today! We provide free, no-obligation quotes in Weston, Chestnut Hill, Brookline, Boston, Cambridge, Quincy, Watertown, and throughout Massachusetts.